Sometime last year, I had enough of my daughters' toys. I mean, you can only pick up little pieces of plastic so many times before you lose it. It was time to get organized. 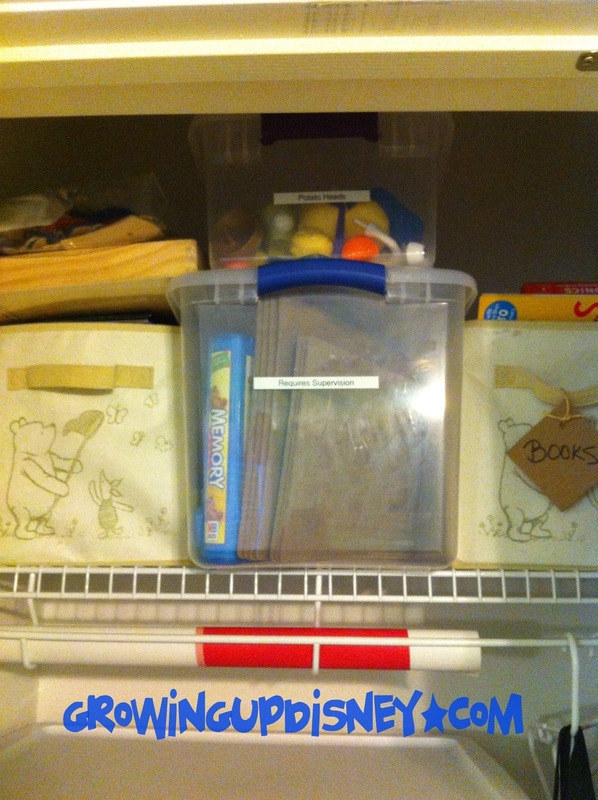 Minnie's bedroom is where we keep most of the toys and it has two narrow closets. The one in the corner is for more long term storage and our book rotation. 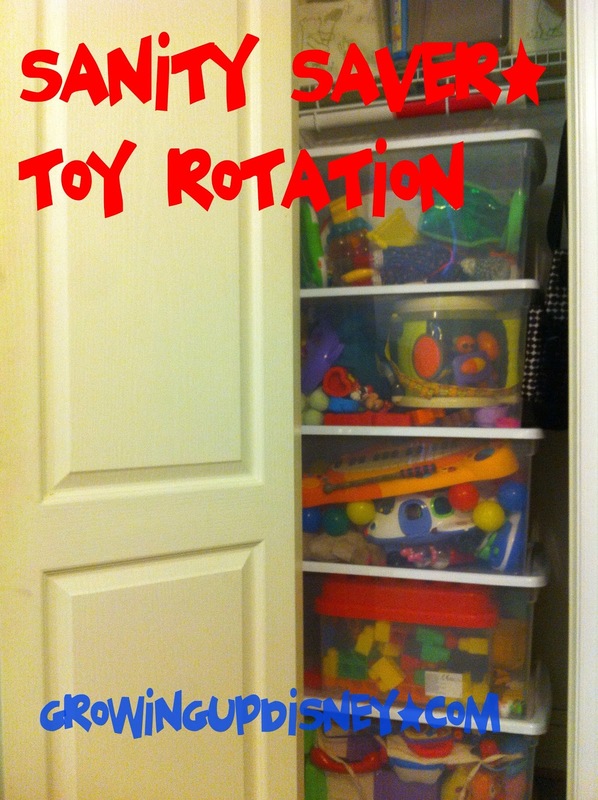 In the easier to access one, I have a toy rotation system that helps keep our house a bit less cluttered and means clean up time is much quicker. 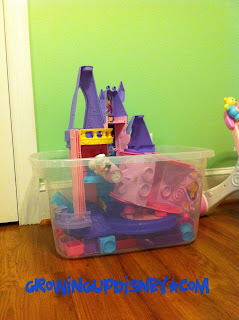 The girls' favorite toys, such as the princess castle and dress up supplies, stay out all the time. The rest has been divided into 6 groups. 5 bins are stored in the closet and the other set is out for play. Even if they drag it all out, the smaller quantity of toys at any one time keeps me calmer since I know it won't be a huge project to put away. It works best when I swap out for a new bin every week but I don't always get around to it. The girls love getting "new" toys and it is fun for me to see the new ways they play with things they haven't seen in a while. We have a bunch of Fisher-Price sets and those are one set per bin. 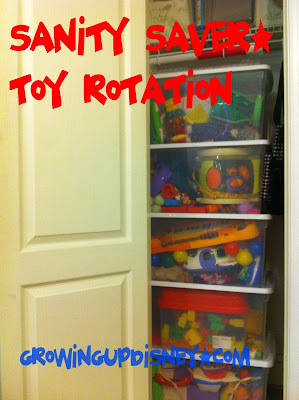 I also try to put together toys with a similar theme, for instance, most of the instruments are in one box. If you're crafty, you could label the bins but I don't. When I put away this week's toys, the bin goes to the bottom of the stack. Without labels, I can dump them all out and re-sort after a birthday or Christmas. When I'm on my game, I'll pull out toys they've outgrown while I'm switching them out, but that doesn't always happen either. In the top of the closet, I have books I'm saving for when the girls are older and toys require some sort of supervision or parental help. The Potato Heads are up there because I don't want those small pieces all over the house. I get that box out when I need a little more time to finish up dinner and the girls will play nearby but not right underfoot while I'm cooking. Hope this idea helps you and if you already do this, I'd love to hear your tips to make it work even better! Awesome idea. As we are doing a pre-birthday toy purge, I may have put this idea in play! 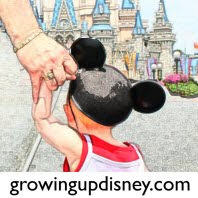 Great idea, I wish I had it when my 2 were little with all the Disney toys and castles. I guess I just put it all in there closets.